Why was Cavalleria Rusticana after Pagliacci, maybe because... No, impossible to guess. The only thing that is important is that it worked very well. This production, unlike the Pagliacci production was not right a way just right for me. Both ideas was all action in the same place. Which naturally meant that the Siciliana was sung backstage when the curtain was down. Then when the opera started all we saw was a desert, and that was Cavalleria Rusticana. Sometimes it was a desert with Jesus on the cross etc, so that was I guess "the Church" and Easter celebration. And a desert with some chairs was Mamma Lucia's tavern. But this desert made it very real when the people came from work with oranges, except, for oranges to grow is not a desert a very natural thing, no. So it sort of worked, but just when you are not thinking :-). So that was the production ideas. But what really made it work was the film in the back ground. Showing the sky and sea. Dark sky when it was almost night still etc. And of course the thunder that made the whole chorus disappear when it started to rain, and made it possible for Santuzza to have a private dialogue with Mamma Lucia (Voi lo sapete, o mamma). And during the duet Santuzza/Turriddu the Jesus-statures was being carried away. But all this would not have worked if the singers had just stood there. It worked because of the great acting and singing, so the director had really done his bit. 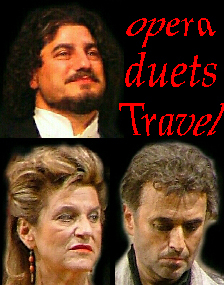 Salvatore Licitra was a wonderful Turriddu and Susan Neves was a wonderful Santuzza. 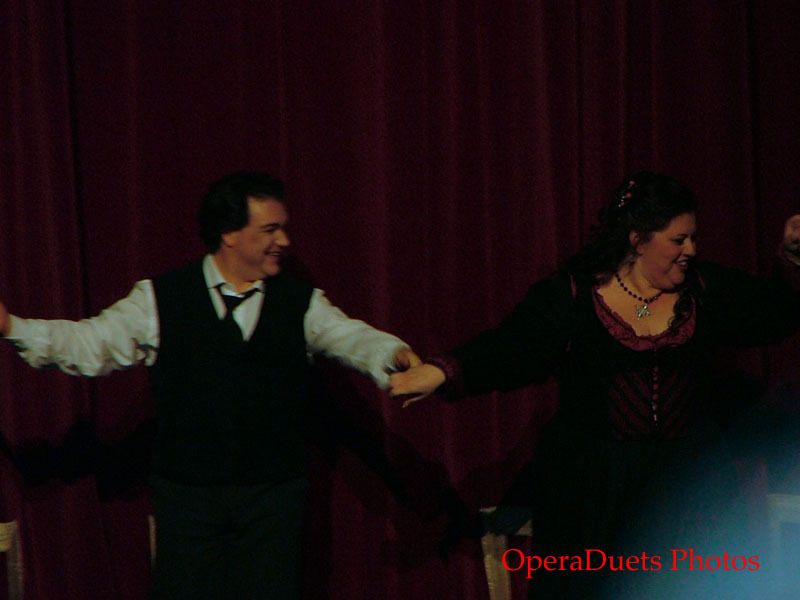 For me the only thing is that Susan Neves, she is a wonderful soprano with great vocal range, but she is NOT a MEZZO. And for me Santuzza is a mezzo voice like Agnes Baltsa. And after the opera, we met the singers from Cavalleria Rusticana: Salvatore Licitra was dressed like a racer driver and Susan Neves looked liked she was just any normal woman, instead of the reality, a FANTASTIC soprano (wow, I wish I had managed to take a splashing good photo of her, but my camera did not take my photos when I pressed the button, but waited some seconds too many). Well, I guess, singers sometimes long for normality after work.